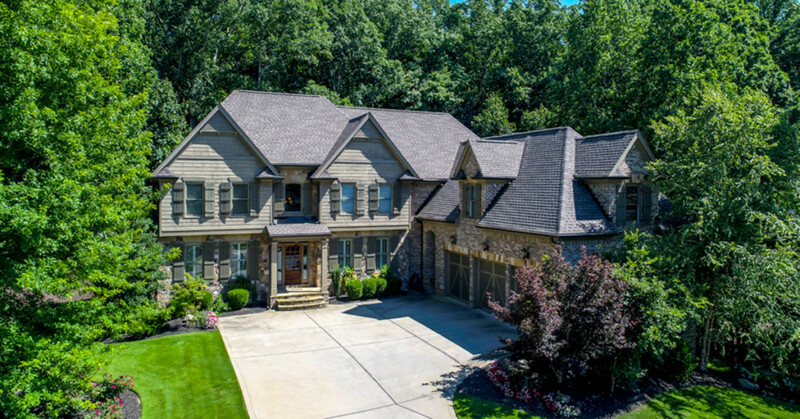 This gorgeous luxury 6BR/4.5BA estate home in Marietta is SOLD! It includes a 3-car garage on a quiet cul-de-sac and features a .72 acre lot with private, wooded views! Take the hosted video tour by CLICKING HERE as there are too many features to include in this post! Throughout this home you’ll find handcrafted details such as this coffered ceiling in both the dining and family room. Upgraded baseboards, wainscoting, crown and chair rail moulding, ornate window/entryway trim and plantation blinds in the formal dining room are sure to WOW at your next holiday gathering. This home also features hardwood floors, 2-story foyer, butler’s pantry, family room with beautiful built-in bookcases and cabinetry next to a cozy fireplace. The window-lined wall allows for beautiful natural light in, and a door from the family room leads out to a huge covered deck with serene, private tree-lined views of your fenced backyard! The spacious chef’s kitchen includes granite countertops, walk-in pantry, built-in refrigerator, dishwasher and microwave. The island has a breakfast bar and stainless steel Wolf gas cooktop with views to the vaulted keeping room with a 2nd fireplace! Double wall ovens make mealtime a breeze. The master on the main features a trey ceiling, huge walk-in closet with custom shelving, spa bath with dual vanities, jetted tub and a multi-head walk-in shower! This doesn’t even scratch the surface of this great home as we have the whole second living level with a bonus room, and an unfinished daylight basement you can finish off if needed or use as storage. Carl Harrison Park and Mountain View Aquatics Center are both within 2 miles for plenty of activities.